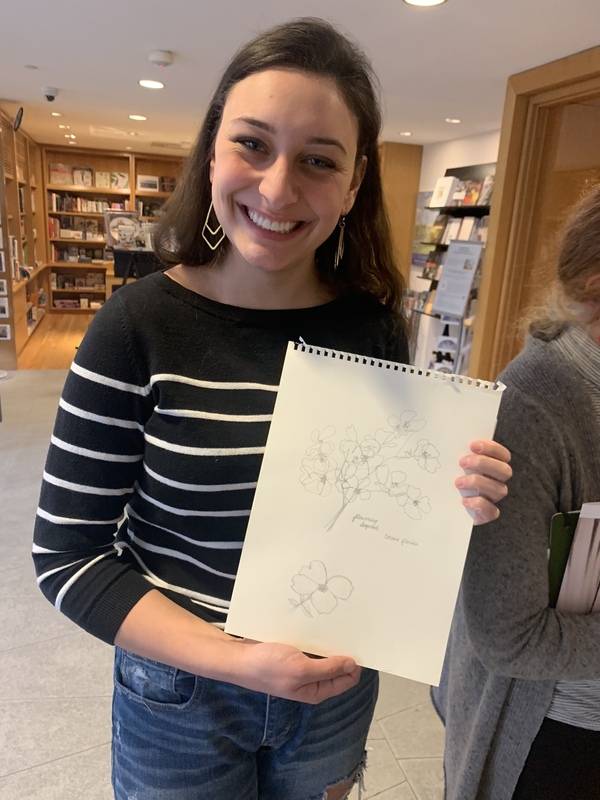 Associate Professor of Romance Languages and Literatures Carolyn Wolfenzon Niego recently brought her Spanish class to a current show at the Bowdoin Museum of Art to turn a grammatical lesson into a fantastical experience. The students visited the unique show Let’s Get Lost—which is a gallery-sized interactive drawing paired with a musical composition called Listening Glass. 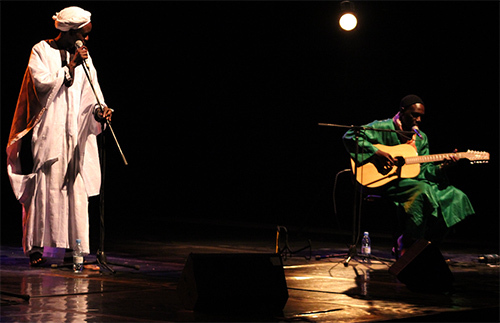 The fusion of pieces allows visitors to immerse themselves in a unique visual, physical, and musical experience. 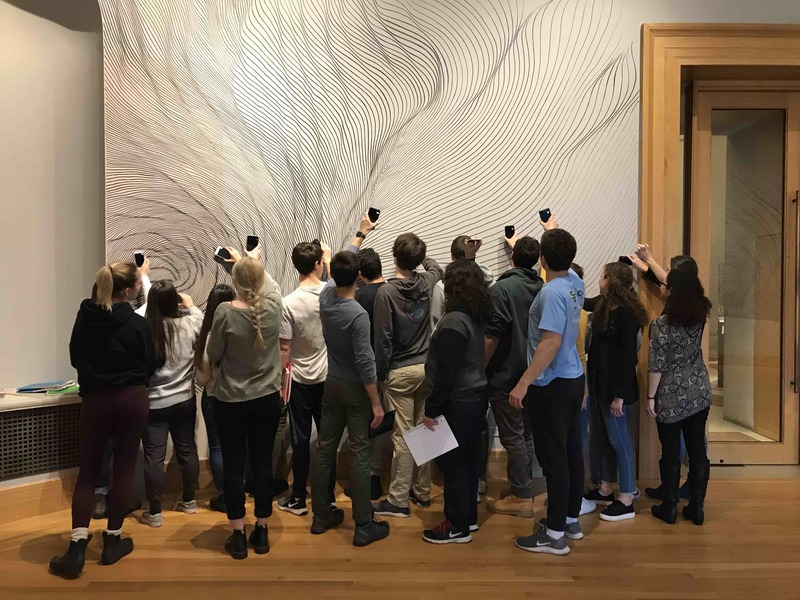 Artist linn meyers worked alongside artist Rebecca Bray, sound designer and composer James Bigbee Garver, and software developer and electronic musician Josh Knowles to develop an iPhone app that generates sound when visitors wave their phones above myers’ artwork. meyers gains her artistic inspiration from what she describes as the “unplanned imperfect.” After learning of meyers’ motive behind Let’s Get Lost, Wolfenzon saw an opportunity for her students in Advanced Spanish to get excited about practicing the Spanish subjunctive. The subjunctive tense in Spanish is used to express the abstract, the unknown, wishes, emotions, impersonal expressions, and recommendations. The tense provides speakers with the license to express their uncertainty and their dreams. So the use of the Spanish subjunctive correlates with meyer’s intention to explore the unplanned imperfect in her sound-producing wavy lines. Wolfenzon’s students practiced speaking in the Spanish subjunctive while interacting with Let’s Get Lost and Listening Glass. An enchanting song filled the Walker Gallery as students composed music from the artwork while reflecting on their innermost hopes. 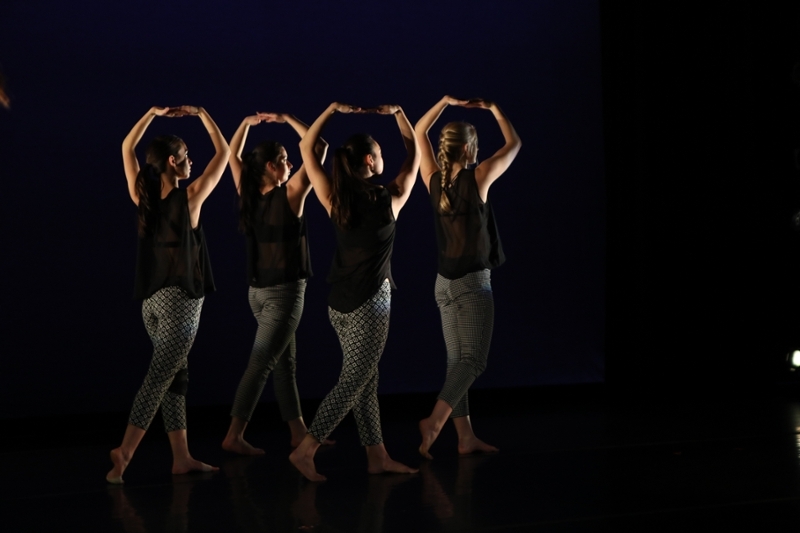 Students danced as they exchanged personal expressions, all in the subjunctive. Laughter blended with the twinkling notes echoing through the gallery. The museum visit demonstrated how art and grammar—which seemingly have little to do with one another—can be fused. And it showed how the unplanned imperfect can lead to opportunity, growth, and, even perhaps, a moment of perfection. 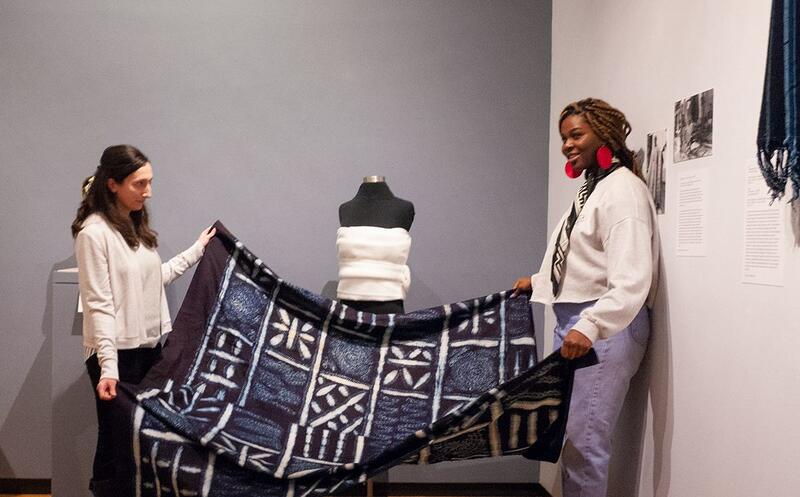 The professor and students who curated a new exhibition on Yorùbá arts in the Bowdoin Museum of Art asked Nigerian-born Anu Asaolu ’19 to help style several of the displayed textiles. The Bowdoin ecology series Field Note Friday held its most recent session in the Museum of Art to take advantage of two current shows focused on nature.